Location - Warson Optics: Providing Quality Eye Care for Over 30 Years! 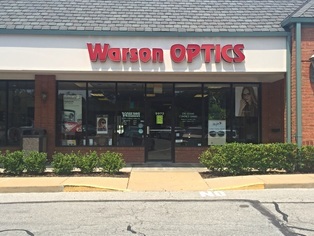 Warson Optics is located in the Dierberg's Warson Woods Shopping Center next to Miss Sheri's Cafeteria. Our office is just 1 mile East of Hwy. 67/Lindbergh Blvd. and is conveniently central to many neighborhood schools, churches, homes, and businesses. Stop on by for a free eyeglass adjustment from our friendly and experienced opticians and you'll see what sets us apart from the big chain stores! Dr. Dan Cerutti has office hours on Mondays, Wednesdays, Thursdays, and Saturdays. Dr. John Bush has office hours here on most Mondays. Please note: These are general guidelines. Call our office at 314-961-3151 for the most-up-date scheduling and appointment-setting information.